Those summer days out at the pool or on the beach are drawing near. That means showing more skin. Are you ready? Is your body ready? If you’ve put off losing those extra pounds or put off gaining those extra “curves”, now is the time before the summer months are in full swing. 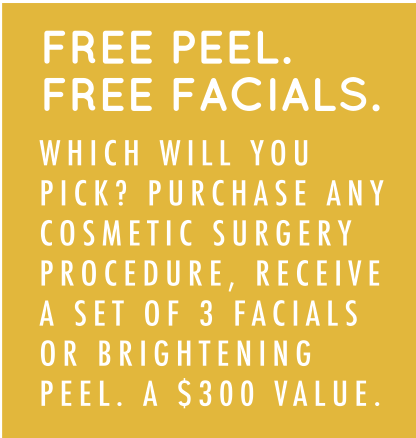 This month we have a $300 value with EVERY Cosmetic Surgery purchased: 3 Facials or a Candessa Brightening Peel. Treat yourself to 3 very relaxing facials or amazing results from our Brightening Peel. . . either way it’s a win-win.